Hanami is the Japanese word for cherry blossom viewing. 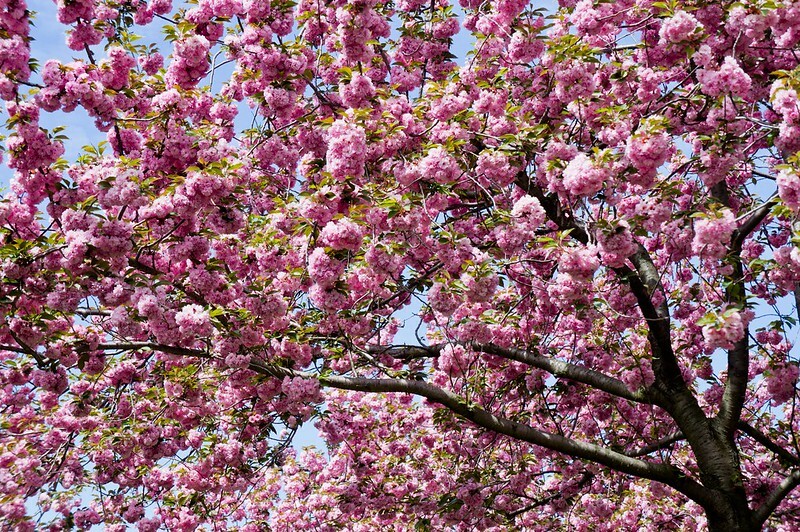 Cherry blossoms is an interesting concept of the fleeting moment of great beauty. It’s full potential is but a fleeting moment and the walk through the space symbolizes that. I spent a few days at the Brooklyn Botanical Gardens just as the cherry blossoms reached full bloom. These only lasted for three weeks and I was fortunate enough to experience them before the rain came. Eventually I would design this with IP cameras focused on different places around the world to enable a “window” to the world that can reside anywhere. Using the Center of Mass code, based on a user’s location within the area of the kinect, the images on the screen will change as you walk further away or nearer to it. At the same time it will play Japanese festival music. Using the Xbox Kinect mounted above the floor, this will track the user using the SimpleOpenNI library for Processing. A screen on the wall will act as a window type where moving from one spot to the other will change the image displayed. Photographed entirely at the Brooklyn Botanical Gardens. Original developed for the Computational Cameras class under Dan O’Sullivan at ITP. Shown at the ITP Spring Show 2012.